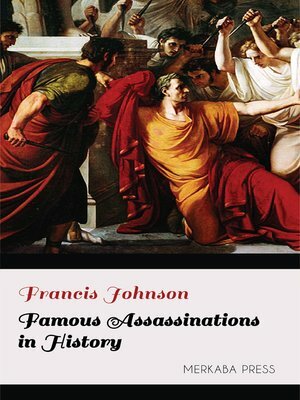 THE thirty-one assassinations, famous in history, which are narrated in this volume, have never before had their stories told in a collected form in any language. The accounts of them were scattered through the historical works of all nations, and through many volumes of private memoirs, which had to be scanned for proper and trustworthy material. It is hoped that their presentation in this form will make an interesting volume, not only for the student of history, but also for the general reader, on account of the historical and psychological interest which attaches to them. These assassinations embrace a period of nearly twenty-five centuries,—that of Philip of Macedon, in 336 B.C., being the first, and that of Alexander and Draga, in the present year, being the last. Only those assassinations have been included which either had an important and political bearing on the world, or on the nation immediately affected, or which left a profound, and, it would seem, indelible impression on the imagination of contemporaries and posterity. All those which were not distinguished by one of these features were excluded from this series. It will undoubtedly occur to some who read this volume that it should have included the assassination of President Garfield. It was omitted, not from any want of respect or sympathy for the memory of our illustrious martyr-President, but simply for the reason that his assassination rather grew out of the morbid aberration of one diseased mind than out of the general spirit of the epoch in which he lived. Others may think that the assassinations of Henry the Third of France, of Henry of Guise, and of Marshal Coligny, which are certainly famous in history, should have found a place here. But they all grew out of the same spirit of religious hatred and conflict in France during the sixteenth and seventeenth centuries, and Henry the Fourth was selected as its most illustrious victim. It has been the object of the writer to make each of these "famous assassinations" the central scene of a picture in which the political, religious, or national features of the epoch in which the assassination occurred are portrayed with historical fidelity and strict impartiality.